Among the numerous improvements and additions Apple is brining to iOS 8 are a slew of new camera modes and settings including timers, focus and exposure settings, as well as developer access to manual controls. When Apple ships iOS 8 to the public in the fall, the company will bring a host of new features to its first-party Camera app by applying software tweaks that leverage existing iPhone and iPad hardware. 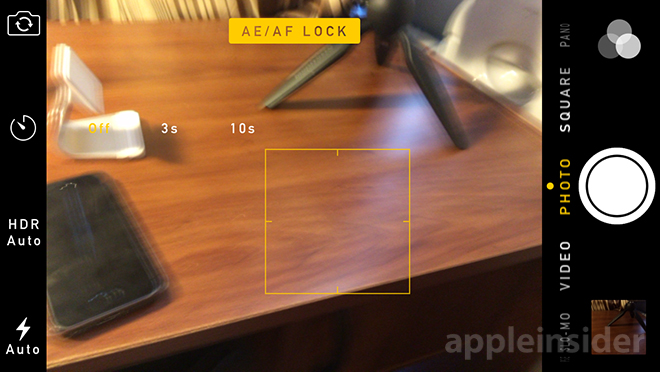 On the user-facing end, iOS 8's Camera brings notable additions like a timer and separate controls for focus and exposure. As seen in the screenshot below, the timer comes with basic three-second and ten-second delays, along with an off mode. 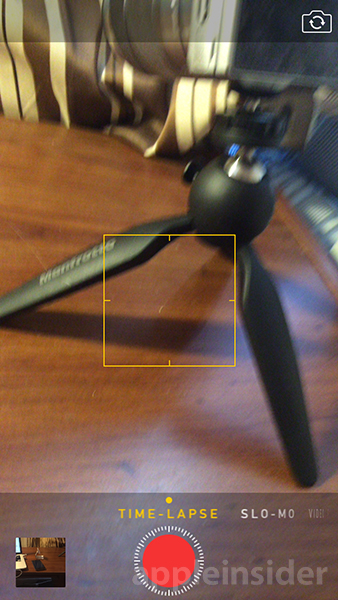 With iOS 8, users will also be able to independently control focus and exposure via onscreen taps. Currently, iOS 7 goes as far as an AF/AE lock, though third-party apps like Camera+ have boasted such functionality for some time. 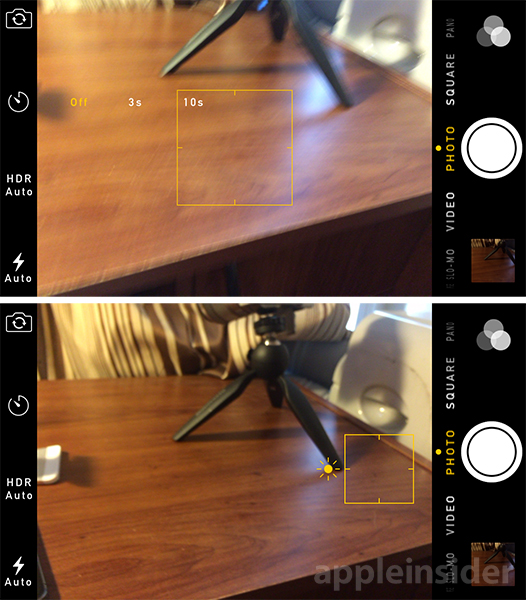 A new time-lapse mode does what it says on the box, letting users create a video composed of snapshots taken at predetermined time intervals. Swiping left to "Time-Lapse," users press the record button and let the iPhone run for a desired period. Once a set is complete, the individual photos are stitched together and played back at a higher frame rate than what was captured. As for iPad owners, one major addition will be a panorama mode, something that has been missing since the feature first debuted in iOS 7. The bigger news for iOS 8 comes on the developer side, where Apple has granted full access to camera controls including ISO, aperture, shutter speed and more. Third-party app makers will for the first time be able to create camera apps that reach beyond the highly automated and constrained implementations previously offered by Apple. Another big feature coming to iOS 8 is PhotoKit, which gives developers functional access to pictures saved in Photos and the Camera Roll. Harnessing PhotoKit, developers can provide special photo manipulations like filters and artistic flourishes directly in Photos without forcing users to open a standalone title. Integration is key and with the latest APIs, it looks like Apple is finally folding in assets from outside sources into its first-party software. Finally, the Camera and Photos backend will be tidied up with iCloud integration so that all photos taken from one iPhone or iPad will be available on all other devices registered under a user's account. 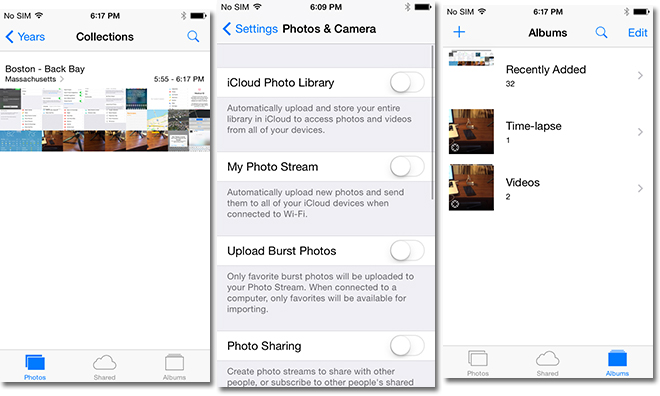 Automatic sorting as seen above will be standard, while upload settings are handled in the iOS Settings menu.